This is ideal for a gang of friends if you cook the pork the day before, then do the other elements just before serving. You can use shopbought tortilla chips to save time. Put the pork shoulder in a large casserole, skin side up. Combine 1 tablespoon of the brown sugar with the paprika, garlic granules, chilli powder, cumin and salt in a small bowl. Rub this spice mix all over the pork, then pour the cider over and around the pork. Cover with a lid and cook in the oven for 4 hours, until tender and falling apart. Slice a small amount off the top of the garlic bulb, just enough to expose the cloves. Wrap in tin foil and place in the oven for the last 45 minutes of the cooking time. When the pork comes out of the oven, it’s time to make the tortilla chips. Combine the garlic granules and salt in a small bowl. Cut the tortillas in half, then cut each half into quarters to make 48 chips. Put the chips on three large baking trays, brush with the oil and sprinkle with the garlic salt. Bake in the oven for 10 to 15 minutes, until crisp and golden. While the tortillas are cooking, put the frozen corn in a jug and cover with boiling water. Leave to sit for 2 minutes to allow the corn to soften, then drain and pat dry on kitchen paper. Heat the oil in a large pan set over a high heat, add the corn and fry for 4 to 5 minutes, until it has caught some colour and charred. Take the meat out of the casserole, leaving the liquid behind. Pull the fat off , but be careful, as it will be hot. Pull the meat apart using two forks and discard any pieces of fat. Put the casserole on the hob on a medium heat. Add the ketchup, soy sauce and the remaining 2 tablespoons of brown sugar. Simmer for 4 to 5 minutes, until slightly reduced. Add the meat back to the casserole and toss to coat, then season to taste with salt and pepper. Transfer to a serving bowl. Once the roasted garlic has cooked and cooled, squeeze the cloves out of the bulb into a mini blender and discard any of the skin. Add the avocado and the juice of one lime and season with salt. Blend until completely smooth. Cut the remaining two limes into wedges. 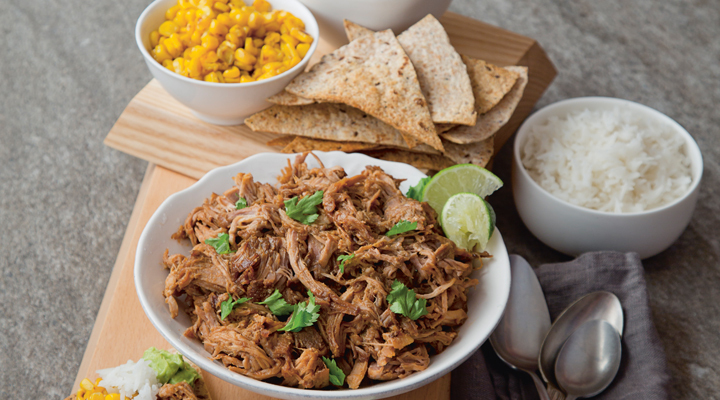 Serve the pulled pork with the tortilla chips, charred sweetcorn, avocado sauce and boiled rice on the side. Garnish with fresh coriander leaves and lime wedges for squeezing over.